Can technology empower people to collaborate on a global scale? How can individuals connect and work together to tackle political issues that transcend national boundaries? 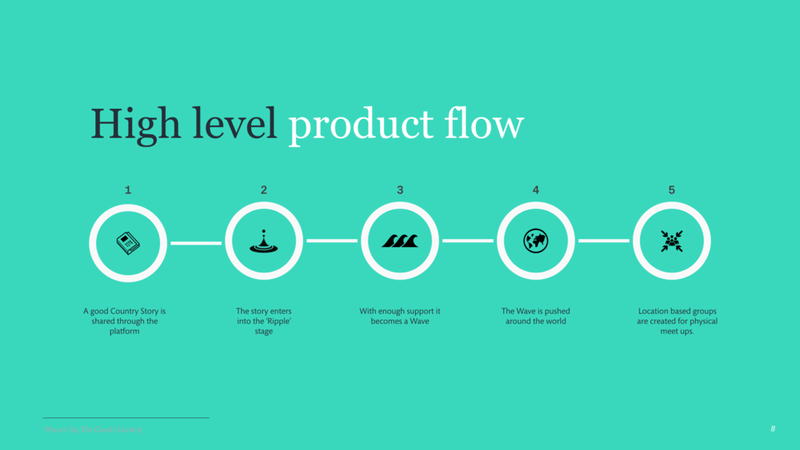 We tried to answer these questions when creating a digital product concept in collaboration with Simon Anholt, founder of the Good Country, a global movement about culture change. For a great intro to the Good Country philosophy watch Simon’s TED talk. Our engagement started out exploring Simon’s vision of ‘Mini Worlds’ which were groups of self organised people working together for the greater good of the world not just themselves, their community or country. With global collaboration identified as the core mechanism to achieve his vision we then focused our efforts exploring the theme of collaboration more deeply. How or why would we facilitate collaboration on a worldwide scale? Through our workshops we outlined what value we could deliver, how we could achieve it and what outcomes were aiming for. In the next phase we diverged, creating many quick concepts that could potentially be developed in line with our values and principles to achieve our desired outcomes. We were lucky enough to be able to call upon members of the Good Country party. Simon has created a very loyal following of people with his philosophy and we tested how our proposition and concepts resonated with members of his party. Through testing our proposition and concepts and further iteration we narrowed our efforts into one concept product. We then started lean experimentation to further validate our concept. Having tested what we considered to be the most high risk parts of the concept we were confident to move the product concept into a higher level of fidelity. The aim now was to create enough to convey the proposition and product to help Simon raise funding for the project.